Charles Mingus stood for many things. He was just not a musician, composer and bass player. He was an individual voice that spoke loud and clear. When I first read about the work of this great composer and bassist it was in a copy of Bass Player Magazine which I had lying around a room in one of my west-side hometown apartments. This brilliant piece of writing was written by John Goldsby, still a regular contributor to the fine pages of Bass Player. It introduced me to the veracity and brilliance of Mingus’s technique and delivery. Since then I have bought a great amount of Mingus music, becoming a fan of his compositional skills. My favourite jazz standard to this day is popular and widely played “Goodbye Pork Pie Hat”. There are a million different versions of this track recorded the world over including a version put together with words sung by Joni Mitchell. 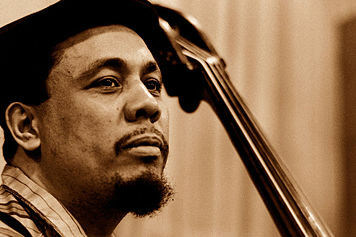 Recently, I had the pleasure of finally viewing the Mingus documentary “Triumph of the Underdog”. Even if one has never given much thought to the work of this American great, it is a must watch for students of music playing and composition and I am recommending it to any, many and all. Throughout this movie, we get to see interviews and insights from the man himself. Mingus’s widow and one of his ex-wives appear at different points. Sue Mingus (Charles’s Widow) has done a great service to the music community to further educate and introduce Mingus’s music to new generations of fans and musicians alike. One of the best moments in this documentary is hearing Mingus discuss his chemistry between himself and longtime drummer Dannie Richmond. Won’t spoil it for readers but it is well worth looking at. Towards the end of Triumph there is very moving audio of Mingus singing into a tape recorder. He worked as long as he possible could until his health problems eventually claimed his life. Mingus was a madman to many, but a marvelous genius to most. A jazz giant and a composer’s role model of good work ethic. All in the face of much personal and professional confrontation. Posted in Notes from the Frogpond.Tagged bass, Bass Player, Bass Player Magazine, Charles Mingus, composer, Goodbye Pork Pie Hat, Jazz, John Goldsby, Mingus, Sue Mingus, Triumph of the Underdog.